The San Diego Trolley is wrapped in pink to recognize Breast Cancer Awareness Month. Drs. Kathlyn Ignacio and Eunice Sanchez-Mata wear pink to celebrate Breast Cancer Awareness Month. 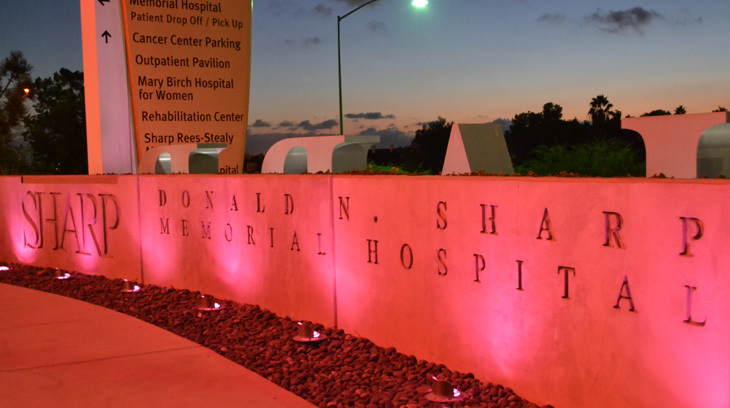 Sharp Memorial Hospital's sign glows pink in honor of Breast Cancer Awareness Month. 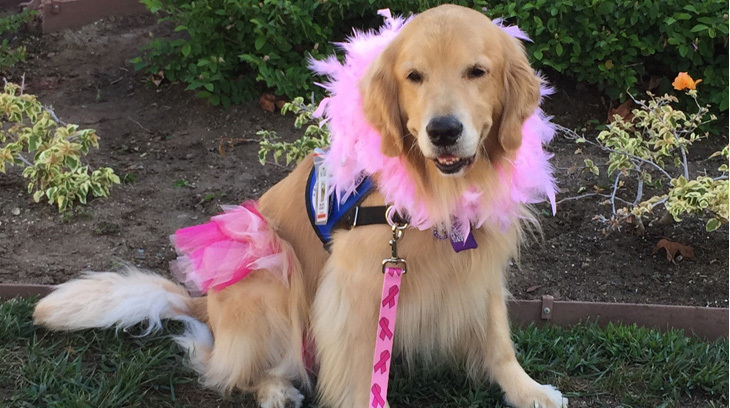 A therapy pet at Sharp Grossmont Hospital wears pink in honor of Breast Cancer Awareness Month. 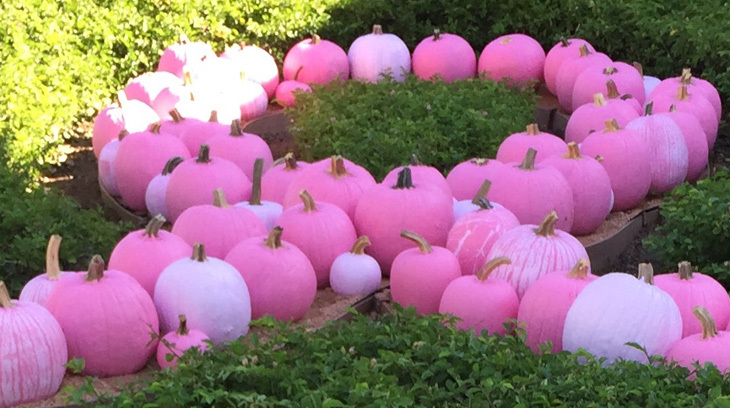 Sharp Grossmont Hospital landscapers painted more than 70 pumpkins pink in honor of Breast Cancer Awareness Month. 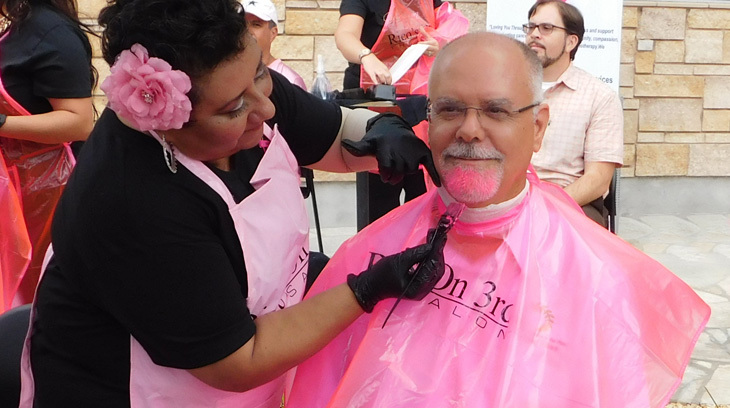 Dr. Phillip Zentner dyed his beard pink in honor of Breast Cancer Awareness Month. Each October, breast cancer advocates, survivors and patients wear pink in honor of National Breast Cancer Awareness Month. The color pink and pink ribbons have become representations of hope and solidarity for the thousands of people who have been touched by breast cancer. The American Cancer Society predicts that 231,840 women will have been diagnosed with breast cancer by the end of 2015. That's why Sharp wants to do its part to raise awareness of this important issue. "These days, more women are surviving breast cancer due to improvements in diagnosis and treatment," says Dr. Sunanda Pejavar, a Sharp-affiliated radiation oncologist. "We believe it's important for women to know their risks, to be advocates for their own health and to know what to ask their physicians, if they need treatment." Here are some of the ways that Sharp HealthCare honors breast cancer patients, survivors and their families this month. Be sure to follow us on Facebook and Twitter to view photos of these events. 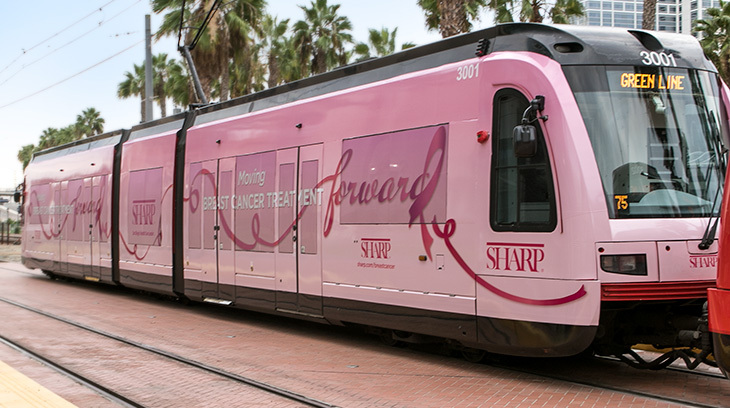 Have you seen the San Diego Trolley wrapped in pink to recognize our work to move breast cancer treatment forward? You might see it rolling through downtown, Little Italy and other stops along the Green Line. On Oct. 16, Sharp doctors and staff across the county observed Wear Pink Day, in conjunction with National Mammography Day. 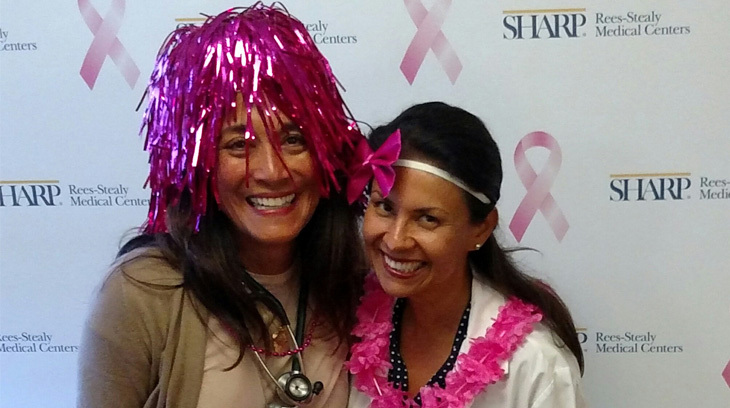 Breast cancer awareness-themed photo booths are set up in each of the six medical centers that offer mammography. Sharp Rees-Stealy was the first health care provider in California to offer the mammography SensorySuite. Patients and employees at the sites can visit these booths in the radiology departments to take selfies and post them on social media. Everyone who posts a photo on Facebook or Instagram tagged with #SRSBreastCancerAwareness will be entered in a random drawing with the chance to win a $100 fitness class voucher. The whole hospital went pink, as the facilities crew bathed the hospital in light to show off the new breast cancer banner, visible to all who pass on State Route 163. On Oct. 10, Sharp Grossmont Hospital sponsored a Cancer Expo, highlighting treatment and prevention of breast and other cancers. Also on the La Mesa campus, landscapers painted more than 70 pumpkins various hues of pink. They will be displayed outside the Cancer Center in the shape of a ribbon for the month of October, and were inspired by the breast cancer journey of the mother of a member of the landscape crew. On Oct. 16, male doctors and staff dyed their facial hair pink to recognize their wives, mothers, daughters, sisters and friends who live with breast cancer. The event was held on National Mammography Day as a reminder to all women and men that the best defense against breast cancer is early detection.